Embraer showed off the first prototype of the E190-E2 last week -- and made an important design change to its larger sibling. Nearly three years ago, Embraer (NYSE:ERJ) announced plans to redesign its signature E-Jet product lineup, incorporating state-of-the-art engines and other design improvements. The goal was to ensure that Embraer's products remained competitive with new and updated narrowbody designs from Bombardier, Airbus (NASDAQOTH:EADSY), and Boeing (NYSE:BA). Last week, Embraer rolled out the first of its new E2-series jets -- on time and on budget. This puts it on pace to deliver the first one in early 2018. Embraer also revealed a key design change for its largest E-Jet model that could make it a lot more competitive with the alternatives. Embraer's E190-E2 made its public debut on Thursday. The plane seats approximately 100 passengers, like the older E190 jet. This makes it smaller than anything sold by Boeing and Airbus, putting it in a comfortable niche. The E190-E2 maintains the same fuselage as its predecessor, which is great news for passengers. The E190 has ample headroom, wider seats than a Boeing 737, and no middle seats thanks to a two-by-two configuration. Going forward, the E190-E2 will compete primarily with Bombardier's CS100 jet. The two planes are likely to be relatively similar in terms of capacity and fuel efficiency, but the CS100 has more range. However, low prices will be a key selling point for the E190-E2. Embraer is still on target to keep development costs to just $1.7 billion for the whole E2 family of jets. 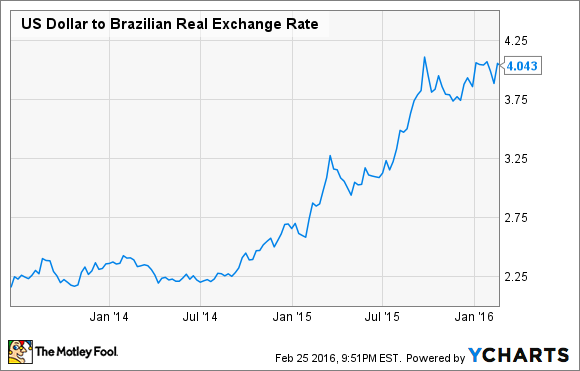 It has been helped by the collapse of the Brazilian real, which has depreciated by nearly 50% since mid-2013. US Dollar to Brazilian Real Exchange Rate. Data by YCharts. By contrast, Bombardier has spent more than $5 billion to develop its CSeries jets. Furthermore, CSeries production costs will probably be quite high for the first few years, due to it being a completely new design, leading to further losses. This limits Bombardier's ability to offer big discounts -- although it is becoming somewhat more aggressive. Embraer's E190-E2 has a lower list price than the CS100. With low development costs and an expected smooth production ramp-up (due to its similarity to the E190), Embraer can also afford bigger discounts, giving it a big pricing advantage over its only major competitor in the 100-seat market. Over the life of the first-generation E-Jet program, the E195 has been markedly less successful than the E190. It is only slightly larger than the E190, but in some configurations that's enough to require an extra flight attendant. It also has less range than the E190. As a result, the E195 has only received 166 firm orders, compared to 578 for the E190. Embraer's E2-series jets will all provide big fuel efficiency gains. Image source: Embraer. Embraer stretched the second-generation E195 by three rows to differentiate it from its smaller sibling. The stretch also means that the E195-E2 will offer a 23% fuel efficiency improvement over the E195: even better than the E190-E2's 16% improvement over the E190. The E195-E2 has a lot going for it. Like the E190-E2, it's cheaper than the competition. And while it is closer in size to Boeing and Airbus' smallest offerings -- the 737 MAX 7 and A319neo -- the E195-E2 is more fuel-efficient than either of them. The E195-E2 also has significantly lower trip costs than the 737 MAX 7 and the A319neo because it is smaller and lighter. The E195-E2's range is its biggest deficiency vis-a-vis the rival offerings from Bombardier, Airbus, and Boeing. It was originally advertised with a 2,000 nautical mile range. That's far below the 3,000 nautical mile-plus range of its competitors. However, Embraer made a surprise announcement last week: The E195-E2 is getting a bigger wing, extra fuel capacity, and a higher maximum take-off weight. That will boost its range by up to 450 nautical miles. This doesn't close the gap with Bombardier, Airbus, and Boeing, but it narrows it considerably. The E195-E2 still won't have transcontinental (U.S.) range, but airlines wouldn't typically fly a plane of that size on transcontinental routes anyway. The E195-E2's extra range will thus mitigate one concern that could have steered airlines toward competing models. The future of Embraer is riding on the E190-E2 and E195-E2. So far, it looks like these two new planes will deliver on their potential and lift the world's No. 3 aircraft manufacturer to new heights.